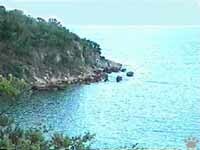 Caribbean coast near Guanica, Puerto Rico. I've always been skeptical about the so-called cryptozoology. I do not believe in yeti, bigfoot, Nessie, Ogopogo, Mokele-Mbembe, curupuri, or other creatures supposed to be hiding in deep lakes, high mountains or dense rainforests. I think they all belong to fairy tales, together with flying saucers, Bermuda Triangle, ghosts, gods of all religions, and voodoo spirits. There are lots of creatures on our planet that scientists haven't discovered yet, but they are mostly of little or no interest to general public. Only zoologists are interested in them, and only zoologists discover them from time to time. As soon as you hear about "professional cryptozoologists", or "yeti experts", you can be sure there is some con science involved. But if you start studying microscopic roundworms, or, say, soil beetles, you can sometimes describe a new species from your backyard, or few hundred new species during one month in tropical forests. tops of Cordillera Central. In late 1999, we had to cancel our trip to Mexico, and decided to visit Puerto Rico instead. We didn't plan any scientific research, just little hiking, birdwatching, caving, scuba diving, and a lot of sunbathing. We had no equipment with us, except for snorkels, masks, and flashlights. I had almost no time to collect some information about flora and fauna of the island, and what I could find, was interesting, but sad. Once upon a time, Puerto Rico was among our planet's most wonderful biodiversity centers. Together with other Antilles, it became disconnected from both American continents millions of years ago, and slowly moved eastwards, carrying many ancient inhabitants of the Neotropics. Later on, the relatives of island species on the mainland evolved or became extinct, but some of them survived on the islands. Lizard-cuckoo, Guanica. Among the "living fossils" were terrestrial sloths, solenodons, primitive shrews, and many interesting rodents. However, this splendid fauna didn't include any large carnivorous mammals. Prior to the arrival of humans, the island's largest terrestrial predators were boas (Boa constrictor), hawks (Buteo), and Puerto Rican lizard-cuckoo (Saurothera vieilloti). After European colonization, the island shared the fate of many other "Lost Worlds", and lost most of endemic fauna to hunting, deforestation, introduced species, and other reasons. It was hit even more heavily than other Greater Antilles, because of its small size (only 160x56 km/100x35 miles), and the longest history of colonization (it was the first one to be settled by Europeans). In the early 1900-s, only 1% of the original forests remained. The decline in local agriculture resulted in gradual reforestation, so the island is now 40% forested. But this change came too late for many local plants and animals. deep caves. Cueva del Vienta, Cambalache Forest. Among other things, Puerto Rico lost all its mammals, except for bats and manatees (some of them were hunted down to extinction by local Taino people prior to the arrival of the Europeans). Now the only terrestrial mammals in the island forests are introduced mongooses, European black rats, feral cats and few other "illegal immigrants". San Juan - the oldest European city in Americas (founded 1493). Despite the losses, the island has enough interesting things to attract an attention of a naturalist. 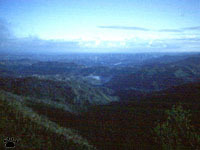 Its mountains are still largely forested; its coral reefs are mostly in good condition; its birds, plants, amphibians, and invertebrates are unique and beautiful. Besides, it is a peaceful country with friendly people and well-developed infrastructure. So, many biologists have been working here, and many of local students have become naturalists, too. There are many Nature reserves here, and some programs are underway to save the island's endangered plants and animals. Camuy Caves, Puerto Rico. You would expect such a place to be thoroughly studied, but, amazingly, the island is famous in "cryptozoological" circles. It is one of the areas where "el chupacabra", the demonic blood-sucking monster of Tropical America, is believed to appear most often. Unfortunately, the topic was "highjacked" by ufologists and other con scientists as soon as it became a focus of public interest, so no serious research was ever done. There is probably nothing behind this myth; but there are some more real mysteries in Puerto Rico, too. In 1957, one of the island's bat species, presumed to be extinct, was found on Puerto Rico and adjacent islands. Many new cave animals have been found in the extensive cave systems. What is even more intriguing, some experts believe that at least one native rodent, Isolobodon portoricensis, have still been existing on the island in the 1980-s. This guinea pig-size animal was once semi-domesticated by native people. They have probably brought it from Hispaniola many centuries ago. By the time of European arrival, it was abundant on both islands, but introduced mongooses soon wiped it out. Its presence on Puerto Rico was last documented in early 20th century. 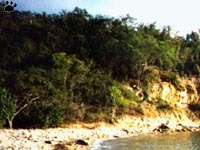 Guanica Dry Forest, Puerto Rico. Guanica Forest Reserve on the island's Southern coast is one of the most interesting Natural areas of Puerto Rico, but definitely not your prime choice if you are interested in cryptozoology. It has unique flora and fauna (some of local plants exist nowhere else in the World), but it is small, easily accessible, crossed by paved roads, and regularly visited by birdwatchers. We spent a lot of time here, too - not only looking for rare species, but also enjoying its small, quiet beaches, popular among locals but almost unknown to gringo tourists. Birds of Guanica Forest Reserve, top to bottom, upper row: Pelecanus occidentalis, Elaenia martinica, Margarops fuscatus (2 photos), Ardea tricolor; middle row: Quiscalis niger, Icterus dominicensis, Spindalis zena, Melanerpes portoricensis, Chordeiles gundlachii, unknown rail, Tiaris bicolor, I. icterus, Vireo latimeri; bottom row: Coccyzus minor, Dendroica adelaidae, Columbina passerina, Charadrius wilsonia killing a crab, Coccyzus americanus. One night, I was patrolling a dirt road leading to "our" beach, in search of Puerto Rican nightjar (Caprimulgus noctiferus), a cute nocturnal bird that now survives only in Guanica area. I didn't seen it that night, but I found some nice snails, and saw a native species of small owl (Otus nudipes). I had descended all the way to the beach, and had turned back already, when I suddenly saw a woodrat-like animal on a low branch. You can imaging my feelings when I realized that it was not an introduced Old World rat (Rattus), but something different - on an island with supposedly no native rodents in existence! Playa Jaboncillo, the location of the first sighting. I could observe it for some time, as the animal was very tame, but I had no camera to take a picture. So, I had to draw it, the way naturalists had had to before the invention of photography. The shadows of great biologists and explorers of the Past stood laughing behind my back, as I tried to make these pictures look more like the animal I'd seen. Anyway, I have informed some people interested in Caribbean mammals (including Dr. C. A. Woods, leading expert on Antillean rodents), about this observation and its precise location. In July 2000, we came back to Guanica, armed with camcorder, rat trap, trapping permit, and lots of flashlight batteries. Every night, we would set our trap, baited with bread and peanut butter, or a banana, or an apple, and then hike around, listening for every sound, and coming back once an hour to check the trap. It was a difficult process, because there were lots of small, but noisy creatures around. The main problem, however, was the abundance of black rats in the area - they made a lot of noise, but were difficult to see. We had to spend few minutes every time to pinpoint the source of noise, and make sure it was a "wrong" rodent again. For the same reason, our trap proved useless - every time we checked it, there was a fat black rat inside, helping itself on our bait. Our permit did not include removal of rats, so we watched helplessly as some individuals got themselves trapped 3-5 times in one night. Noise-makers of Guanica dry forest,left to right, top row: hermit crabs (Coenobita clypeatus, in Cittarium pica seashell, 2 photos), ground gecko (Sphaerodactilys sp. ), anole lizards (Anolis cristatellus, two photos); bottom row: house mouse (Mus musculus), Jamaican fruit bats (Artibeus jamaicensis). Our expedition after a night of rat search. After many nights of finding nothing, both of us were completely exhausted, despite spending days on a nice beach. But than, I finally spotted "our" rodent crossing a road far upslope from the site of the first observation (see map). We moved our search/trapping efforts to a dry, densely forested canyon, and next night I finally got a good look - and, more importantly, some video footage - of the "mystery rat". Actually, rats - there was a whole family of them, mother with two young animals. Surprisingly, the youngsters had different color - they were blackish, while the adult animal was gray, just as the one I'd seen in December 1999. Snapshots from the videotape of the mystery rodent. As you can see, the animals were relatively tame (although less so than black rats): some of the pictures were taken from a distance of only 3 m (10'). Only one of the young animals got videotaped - they spent more time under cover of dense vegetation (bottom row). Larger images can be seen here. Note that the animal seems smaller than it was, because its eyes reflect light and seem larger. For some reason, the tail looks dark, although it was covered with short silvery fur. I still do not know what species it was. Most Puerto Rican rodents, including Isolobodon, have never been seen by scientists, except as skulls and bones, so nobody knows exactly what they've looked like. Besides, it could be an "unregistered" introduced species, such as a woodrat (Neotoma) from North America, or some South American rodent. Hopefully, sooner or later somebody will be able to trap it. Until that time, I prefer to call it "Neotoma sp. ", although I was unable to find any North American species of woodrat that would be an exact match. I'm waiting for experts to tell us what they think. Pictures of unidentified rail we videotaped in mangroves of Guanica Forest can be seen here.